Thursday... and I get to go back to work... and I'll get to go back for 6 days in a row - no breaks. Ah, well, that's life. I rode 5 miles on the bike this AM. It was okay. I'm much better later in the morning or early in the afternoon. This is one of my personal challenges, to hop on the bike at 0615 and ride for 12 - 15 miles. This means that tomorrow morning I'm going to have to jump on the bike and ride at least 6 or 7 miles. Saw some biting comments in Bloomberg yesterday about the Gary Cohn and his departure from the Idiot Jerk's administration; that he stayed long enough to give himself and his other billionaire buddies a permanent tax cut. Oh, and I saw that Betsy DeVos walked out of a press conference down at Parkland... after taking 5 questions in about 5 minutes. The students aren't happy because, she was only prepared to put in an appearance... photo-ops, you know? What more can you expect from a clueless billionairess who was educated, to some small degree, at an expensive private school. This woman will never understand that her net worth has little, if any, bearing on her intelligence. This problem is almost pandemic among the wealthy. She wears the concept of "I'm rich so I'm smarter than you," like a well fitting dunce cap, which means she's stylishly stupid. When I went up to bed last night I'd found that both dogs had gotten there before me. This is somewhat unusual in that Lily sleeps on the sofa till I head upstairs, and then follows me up. However, last night, when I turned on the bedroom light, this is what I found. 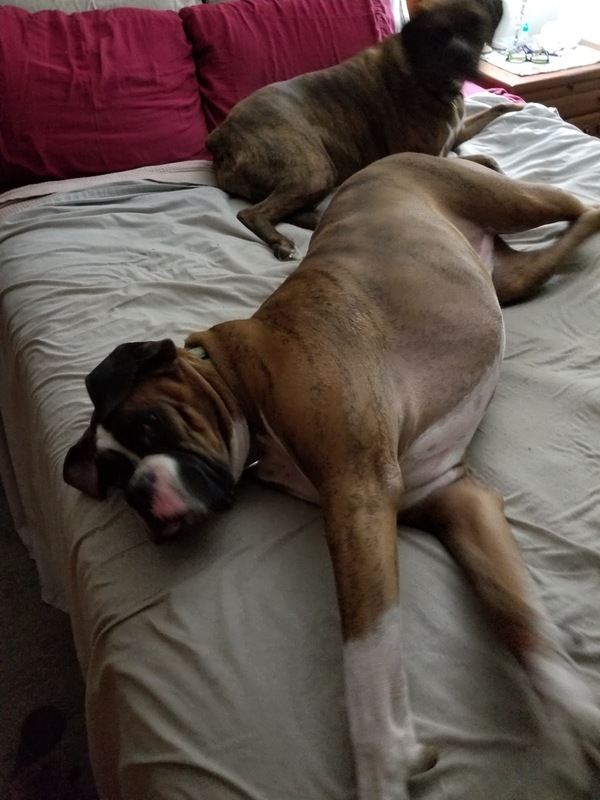 That's a queen size bed, and as you can see, they didn't leave me a lot of room. Actually it's rather easy - they're both hams, I get out the phone to take a picture and... voila, empty space.